​The peacock has an elegant and readily recognisable shape. A slender head, long neck and a splendidly arrogant and magnificent tail, which, when fanned out, becomes an exquisite, repeating tracery of flowing fronds. A favourite of designers and artists down the ages, it rises to the height of perfection when combined with iridescence on Carnival Glass. Our all-time-favourite is Northwood’s Peacocks (on the Fence) which combines brilliant design with magical colour and iridescence. ​But there’s something you might not have noticed about Northwood’s Peacocks pattern – and it explains why it is such a satisfying and enduringly popular design – and it’s all about the Power of the Triangle! When you look at a picture, your eyes usually travel from left to right, starting at the bottom and moving upwards. A triangular shape within that picture will draw the eye and strengthen the design – and that’s exactly what that subtle triangular shape of the two peacocks does. It attracts and holds your gaze. It also gives a sense of unity, of wholeness to the entire picture. As can be clearly seen in Glen's illustration on the right, the power of the triangle is perfectly portrayed in the strategic placing of the two peacocks in Northwood’s Peacocks pattern. It was the mark of a brilliant designer, a trained artist who knew how to arrange his composition for maximum effect. Was it Harry Northwood himself who was responsible for this masterpiece? Almost certainly … yes. He was classically trained at the Stourbridge School of Art in the famed glass region of the British Midlands, winning several awards for his work. He also painted in oils and water colours. ​This drawing is a design by Glen Thistlewood. ​It was inspired by the Northwood Peacocks pattern. ​RD 6019293 is the ​Registered Design Number of Glen’s work. Above: a Northwood's Peacocks on the Fence plate in purple (left) and an aqua opal bowl on the right. ​Harry Northwood’s skill and talent were recognised within the glass industry as this extract from the 1905 “Glass and Pottery World” shows: “Mr Northwood inherits the artistic sense through several generations of glass makers. He not only creates beautiful ​designs and shapes, but he also has a large plant, well equipped to quickly produce what the dealer requires.” Harry was also described as possessing a “genius in designing new shapes and decorations”. 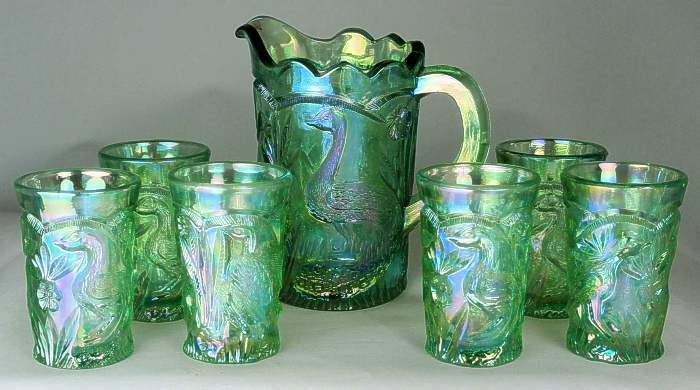 There’s no doubt about it … Harry’s Peacocks is arguably one of the finest examples of Classic Carnival Glass design. Let’s stay with Harry Northwood for a little while, as we want to share an astonishing photograph with you! The black and white photo (below) shows Col. Will A. Rhodes, and Chas De la Croix. 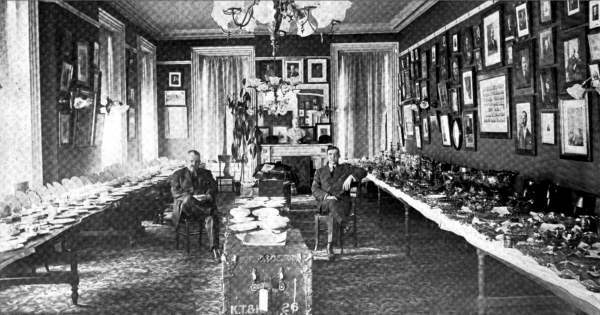 Chas was an agent for Northwood, and he is sitting alongside a massive sales display of what appears to be Northwood’s Carnival Glass. The photos are too small for clear study here, but we’ve posted them for you in higher resolution on our website so you can look at them more closely. It is possible to make out what some of the items are, indeed a variety of familiar Grape and Cable shapes can be spotted. De la Croix would have been using the display as a sales event, taking orders from the buyers who came to visit the hotel where they were set up. The display on the left of the picture was all china. 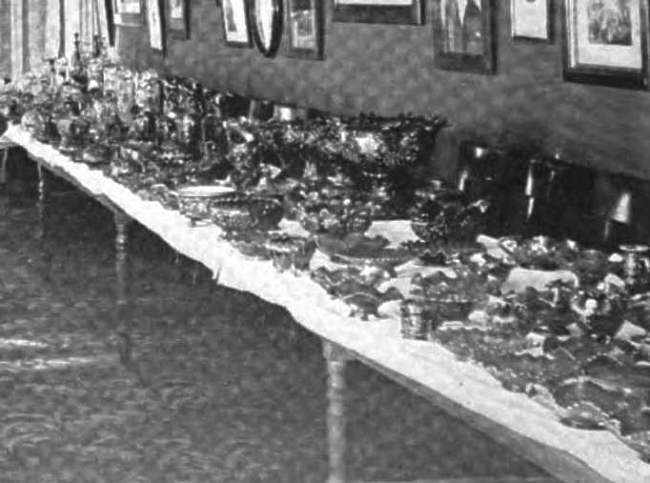 Note the large trunks in the foreground, which is surely what the china and glass were packed in for transportation to the hotel. Right: a magnified close-up of the Carnival Glass on display. Mike Carwile recently found this fascinating Fenton Holly hat, and he immediately realised there was something unusual, different and significant about it. Can you spot what it is? ​If you said “the edge shaping”, then you are absolutely correct. Mike had spotted how unusual the edge was, and his search for a similarly shaped Holly hat with this unusual 3 in 1 edge proved fruitless. Mike explained how he believes it was created: “I know that it had a CRE (candy ribbon edge) crimp first and then it seems that they used the foot pedal crimping tool to then put a 6-point crimp on it last. I’m familiar with those crimping methods from making 18 pieces at Fenton during the Glass Making Classes they had each year”. Below are two more photos of the Holly hat - they show the edge treatment very clearly. ​​Mike asked us for our thoughts on it too, and we recalled some information that the late Frank Fenton had given us with regard to edge treatment. Fenton factory (a few years ago). ​It’s interesting to note that Frank liked to call the edge shape we all refer to as a 3 in 1 edge, a “fruit crimp”. The bowl is held in a snap, and whilst still hot and malleable, it is pressed down onto the crimp tool (right) - in this case, an 8 point crimp. ​So there it all is, as Mike said … the fine crimp (candy ribbon or continuous crimp) edge was created first, then the Drop Crimp tool was used to put the six crimp on it. Effectively, the hat was given a double crimp, which created the 3 in 1 edge. ​Sincere thanks to Mike Carwile for the photos and for the fascinating story. These peacocks are a little different because they are inverted (intaglio or “cut in”) - the pattern is called Inverted Peacock. So, what’s the story and what’s the little secret? The Inverted Peacock water set was the first miniature water set to be made in Carnival Glass. It's tiny! The pitcher is only 3¼ inches tall, and the tumblers are 2 inches. ​It was a joint operation: produced in 1977 by Mosser, using moulds crafted by Botson's Machine and Mould Company, Cambridge, Ohio. The mouldwork detail is amazing for something so small. The sets were sold wholesale by Russ Vogelsong of Summit Art Glass. ​The little secret is discovered by looking at the base of the exquisite, tiny, emerald green pitcher that stands just 3¼ inches high. Moulded in script are the words “Carnival Glass Encore” followed by “1977” and “KC Mo. DT”. ​What does it all mean? This miniature water set was produced for Dorothy Taylor ("DT") of the "Carnival Glass Encore" Contemporary Carnival Glass Club, based in Kansas City, Missouri "(KC Mo"). It was a milestone … a contemporary Carnival souvenir that was made to coincide with Encore’s first national convention, forty years ago. The mini water sets were sold for $26.95. And there’s yet another little secret … the mini sets were modelled on an earlier full-size version, made around 1915 in crystal glass (not iridised) by Cambridge. You can read all about it here: Encore miniature water sets. From the official catalogue of the London 1862 World's Fair. and the ash not falling off to the injury of clothing. Price-lists and samplers will be forwarded to merchants and the trade on application. ​and recommended to the attention of exporters."